Exercise enthusiasts look to avoid injury like the plague. Injuries are akin to kryptonite for athletes, who tend to be averse to inactivity and unaccustomed to life away from the gym. But injuries are a legitimate threat to athletes of all ages. Fortunately, there are several steps athletes can take to reduce their risk of injury. · Work with a professional. Even veteran athletes can benefit from working with a professional, who can help individuals tailor a workout routine that best suits their bodies and fitness goals. A trainer can show you how to use machines properly, and many trainers stay abreast of the latest developments in exercise science, making them valuable sources of information on everything from workout tips to stretching techniques and more. Even if you can only afford one or two sessions with a trainer, make the most of those sessions by asking as many questions as possible. · Recognize your limitations. If you’re just starting out, don’t push yourself, as your body will need time to adjust to regular exercise. If weightlifting will be part of your new routine, lift light weights initially and gradually work up to heavier weights as your body grows more acclimated to strength training. · Take a slow and steady approach to each workout. Warm up your body before hitting the weights or going full bore on the treadmill. Warming up before a workout readies your muscles for the stress that’s coming later in your routine. If you don’t warm up beforehand, your muscles will be cold and loose, possibly leading to strains, tears or other painful injuries. · Stretch at the end of each workout. While novices will almost certainly experience some soreness and stiffness at the onset of their routines, such feelings are normal because you are exercising muscles that likely have not been worked out in quite some time. But as your body becomes acclimated to routine exercise, that soreness and stiffness should go away. If it does not, that’s likely because you are not stretching enough at the end of your workouts. Stretching helps the body return to a more natural position, reducing the likelihood that you will develop tight, sore and stiff muscles. · Take time off. Even the most accomplished athletes in the world take days off from their exercise regimens. Tired, overworked muscles are more susceptible to injury, so make sure your body has enough time to rest and recover. Skip a workout if your muscles seem stiff and sore, or change up your routine so you aren’t taxing the muscles that don’t feel up to snuff. Local Highlight! 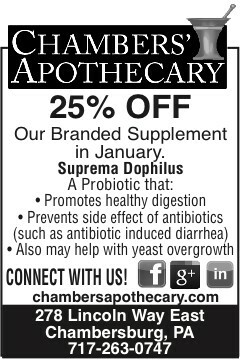 Chambers’ Apothecary! Everything you would expect from a traditional pharmacy, along with compound medications, special healthy living events, natural products and an educated staff committed to our community’s health!